From fresh strawberries to orange juice and multiflavored fruit snacks, children receive vitamin C from a number of sources. An antioxidant known for shortening the duration of the common cold, vitamin C helps the growth and maintenance of the body's tissues. Children need to eat foods filled with vitamin C because the body does not make the vitamin on its own. Thanks to stories of pirates who didn't have access to fruits and vegetables while at sea, scurvy is a well-known side effect of what happens when there's too little vitamin C in the diet, but few people know the effects of too much vitamin C.
While it's highly unlikely, a child can receive an overdose of vitamin C if she takes a "megadose" of a vitamin supplement that greatly exceeds the tolerable upper intake level for her age. An overdose can result in illness symptoms, but it is not toxic and does not require emergency care. In most cases, you do not have to worry about your child overdosing on vitamin C because the body does not store the vitamin. 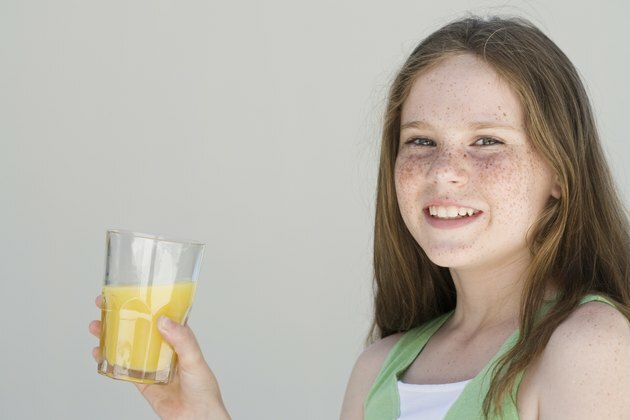 Even if your child receives a high dose of vitamin C through foods and juices and takes a supplement containing vitamin C, she will likely flush out the extra vitamin C when she urinates. The Food and Nutrition Board at the Institute of Medicine sets recommendations for vitamins and minerals. For vitamin C, infants age 0 to 6 months need 40 milligrams a day, while infants 7 to 12 months need 50 milligrams a day. Children ages 1 to 3 years need 15 milligrams daily, those aged 4 to 8 need 25 milligrams daily, and children age 9 to 13 need 45 milligrams daily. For ages 14 to 18, girls should consume 65 milligrams each day, and boys should consume 75 milligrams each day. Unless your doctor has recommended a specific vitamin C dosage to combat scurvy after a severe vitamin C deficiency, a healthy child should not exceed the tolerable upper intake levels for his age. The UL is 400 milligrams a day for children age 1 to 3 years and 650 milligrams a day for children 4 to 8 years old. For children 9 to 13 years, the UL jumps to 1,200 milligrams a day. The UL is 1,000 milligrams per day for all adolescents aged 14 to 18. The U.S. Food and Nutrition Board of the institute of Medicine has not set tolerable upper intake levels for infants, as they should get all of their vitamin C through breastmilk, formula or food. An overdose of vitamin C can cause complications that, for the most part, may make your child feel unwell and uncomfortable, but will not put him in serious harm. Overdose side effects include nausea, vomiting, diarrhea, heartburn, abdominal cramps, headache and insomnia. A vitamin C overdose can also increase the risk for kidney stones. Your child is more likely to be deficient in vitamin C than to consume too much, with side effects including a weakened immune system, slow wound healing, easy bruising, dry skin and hair, nosebleeds and bleeding and inflamed gums. Can Certain Vitamins Help You Grow Taller?